Stephen Kenny's Derry City team celebrate winning the eircom League Cup against Wexford Youths back in 2008 at Ferrycarrig Park. DISPLAYED ON the wall of the Wexford Youths clubhouse at Ferrycarrig Park is a series of framed newspaper clippings documenting some of the club’s proudest achievements and accomplishments. Among them is a report dated Monday, September 29th 2008 from the ‘Wexford Echo’ with the headline “No Final Fantasy for Youths” detailing the club’s historic EA Sports League Cup Final against Stephen Kenny’s Derry City side at Ferrycarrig Park. It wasn’t the dream outcome for the then First Division outfit as the ‘Candy Stripes’ avoided a shock result and romped to a 6-1 win as Sammy Morrow netted a hat-trick.Gareth McGlynn and Gerard Doherty are the sole survivors from that particular League Cup triumph eight years on while Eddie McCallion, now part of the Derry coaching staff, was at right-back on that occasion. 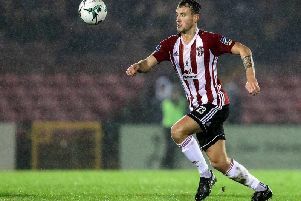 This time Kenny Shiels’ Derry City side had to battle the elements, the strong wind and a determined Wexford side with a striker in Danny Furlong, who incidently also played in that 2008 cup final clash and he caused no end of problems for the City backline. And in the end it proved another hugely frustrating night for Shane Keegan’s troops who find themselves rooted to the bottom of the table after Rory Patterson denied them a share of the spoils right at the death as the underdog fulfilled its role by losing - this time in frustrating fashion. Wexford certainly didn’t play like underdogs and if it wasn’t for City keeper, Doherty in the first half they may well have found themselves two goals to the good! They’ve enjoyed some encouraging displays so far this season and have harshly come away with just one point from the opening five games after tough games against Shamrock Rovers, Dundalk, Bohemians and Derry City. It’s a significant achievement for Mick Wallace’s club to be dining at the top table of the League of Ireland and based on another encouraging display on Saturday night, they’ve so far proven they deserve to be there! For Derry it was a deserving result and they showed tremendous character not to down tools after conceding with eight minutes left on the clock. They seem to be making a habit of digging out wins at the death which is testament to the preseason fitness programme overseen by strength and conditioning coach, Pearse Lafferty. Wexford legs began to fade in the latter stages while Derry pressed for the winner, forcing a succession of corners before the Wexford defence finally folded when Patterson sent that looping header into the back of the net much to the despair of the majority of the 544 attendance.